The top of the line iPhone comes with 512 GB of storage capacity. When you need to back up this iPhone to your computer, you will have to make sure that the system drive (Windows 10 drive) has at least the same amount of free space (assuming that the iPhone’s storage is almost full). Most iPhone and iPad users use the official iTunes software from Apple to back up their iOS devices to Windows 10 PC once in a while or at least before updating the iOS software to the latest version. If your Windows 10 drive is filling up fast or don’t have enough free space to back up your iPhone data, you might want to change the default backup location of iTunes. By now, you might have discovered that iTunes doesn’t allow you to change the default backup location. This means that, if you don’t have enough free space on the drive where Windows 10 is installed, you cannot back up your iPhone or iPad to your PC. Fortunately, there is a workaround out there to change the default backup location used by iTunes. We use the symbolic link functionality available in Windows OS to change the default iTunes backup location used to backup iPhone and iPad. Here is how to do just that. We recommend changing the backup location before backing up your iPhone/iPad. Step 1: Create a new folder called MobileSync at the root of the drive that you would you like to use the new backup location. Make sure that the drive where you have created the MobileSync folder has enough free space to back up your entire iOS device. Where “D” is the drive letter. Step 4: Open the Command Prompt as administrator. To do that, type CMD in Start/taskbar search, right-click on Command Prompt in the results and then click Run as administrator. In the above commands, “C” is the drive letter of Windows 10 drive, UserName is your actual user name, and “D” is the drive letter of the drive (new location) where you intend to save iPhone and iPad backups. 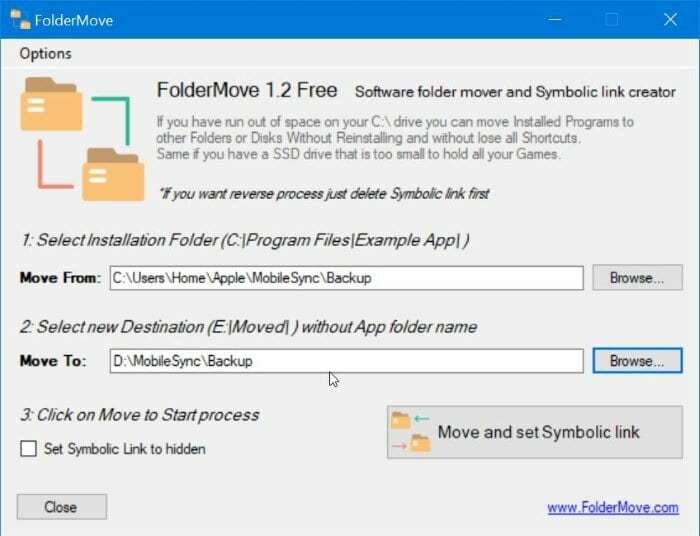 FolderMove is a small utility designed to move folders of installed programs. Here is how to use FolderMove program to change the default backup location of iTunes used to backup iPhone and iPad. Where “D” is the drive letter of the drive. Step 2: Download FolderMove and run it as administrator. Step 3: In the “Move from” field, type one of the following locations depending on where iTunes is installed from. Replace “C” with the actual drive letter of your Windows 10 drive and UserName with your user name. Step 4: In the “Move to” field, type the new location (D:\MobileSync\Backup) which you would like to use as the new backup location. Click Move and set Symbolic link button. You can now backup your iPhone or iPad using iTunes. The backup data will be saved to the new location instead of the default one. How to change Netflix download location in Windows 10 guide might also interest you.